Creating a catering order is no easy task. There are many aspects that you need to consider. Of course, your main concern will be that there is enough variety to suit the taste buds of every guest. A beautifully created salad adds colour and depth to your catering order. Once laid out on your dining table or counter top, the fresh salads provide visual balance as well as being a treat for the taste buds. Salads that are full of colour and texture also make the perfect centrepieces for your buffet or can be used to break up dishes of similar colours. As well as adding to the presentation of the laid out food, salads also look pleasant once they are on an individual’s plate. As well as looking good, a well-designed salads taste great. The range of flavours that can be added to a salad are almost limitless. Using sweet fresh tomatoes, peppery leaves and crunchy carrot as a base you already have distinct tastes and textures. Fresh salads can be as complex or as simple as you want. You could stop at three or four basic ingredients or add meat, fish, nuts, seeds or cheeses. In addition, there are many other salad vegetables that can be added depending on the taste choices of those that will be enjoying the finished product. Fresh salads are great as part of a catering order because it means you can look after those who are watching their waistlines. It can be as difficult to cater for dieters as it is those with food allergies. But, by having a choice of salads available, with the dressings separate, you can help others help themselves without fear of piling on the pounds. As well as helping keep your guests’ waistlines trim, adding salad to any meal or catering order is a great way to help them stay healthy. And while all fruit and vegetables are good for this purpose, carefully crafted salad never gets boring. There are so many different combinations you can try that there is no need to ever have the same salad twice. Again having the dressings separate means that you can easily control the levels of fat, oils and salt that are in your food. By adding nuts or seeds, you can add those essential oils your guests need to keep their hearts in top working order. While considering your guests’ taste and needs is undoubtedly noble, you can’t forget about yourself; regardless of the size of your order, salads are often much less expensive than other snacks. And that alone makes adding them to your menu the best choice! These are just a few of the reasons why you want to consider adding fresh salads to your next catering order. 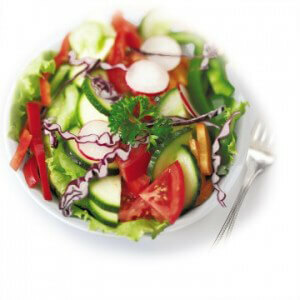 Salad is one of the most flexible dishes you can offer as part of a buffet or a meal. It can be eaten alone, as a side dish or a started; you can even create fruit-based salads as an alternative to high-calorie puddings. 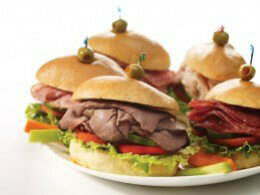 Contact us today to learn more about our catering options. Soft egg buns filled with an assortment of chicken, tuna, salmon, and egg salads; salami, turkey, ham and roast beef topped with fresh vegetables. 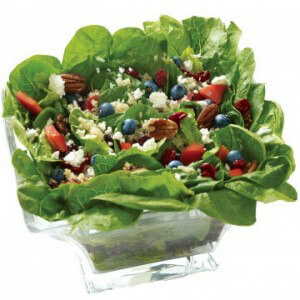 Mixed greens, cranberries, quinoa, goat cheese, nuts, blueberries and red peppers with a balsamic or raspberry vinaigrette dressing. 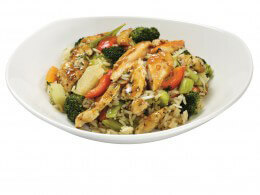 Stir-fried marinated chicken strips and vegetables served on rice or pasta. Sauce choices include teriyaki, roasted red pepper, spicy Thai or soy sauce. All entrées are served with fresh garden or caesar salad. Upgrade your complimentary salad to a Greek Salad for $1.49 PP.